Mirlo Positive Nature, Sociedad Limitada (hereinafter, “Mirlo”), with registered address in Calle Seguidillas, 9, 2B Santa Cruz de Tenerife (Spain) and Tax Registration Number (CIF) B76608595, is responsible for the www.mirlo.co website, hereinafter “the website”. Users should be aware that any information of a personal nature that they may provide shall be used to identify them to other users and to Mirlo. By using this website you are considered to be a user (hereinafter “the user”) which implies full acceptance, without reservations, of the provisions included in these confidentiality rules, together with the terms and conditions of use published by Mirlo when the user accesses the web. We take the utmost care to protect the personal data of website users and through these confidentiality rules we wish to inform you as to what we do with such data. Mirlo has adopted the personal data protection security levels required by the Implementation Regulations of Organic Law 15/1999 concerning the protection of data of a personal nature (Royal Decree 1720/2007). Furthermore, it endeavours to install other additional technical means and measures to avoid the loss, misuse, alteration and robbery of and unauthorised access to such personal data as it may receive. Nevertheless, any data that is transferred over the Internet is at risk of being intercepted; as Mirlo cannot guarantee that this shall not be the case, were it in fact to occur, it does not accept any responsibility for such an occurrence. In those web services which require the user to register as a user, he or she must choose a password. The user is responsible for safeguarding the confidentiality of this password, and that of all the activities that take place during a session opened using his or her name and password. The user undertakes to notify Mirlo as quickly as possible as to any unauthorised use of his or her name and password or any other breach of security. Mirlo shall not be held responsible for damage or loss which may arise due to the user having failed to comply with this obligation. In order to access certain website services such as the purchase of a Positive Nature pack, or participation in any of the Mirlo Positive Nature projects, the user must sign in using the personal data that was requested when he or she originally registered to use the service they now wish to access. In order to provide such services in a satisfactory manner, the user will have to provide all the required data. The data supplied on registration shall be added to a personal data file which is duly registered with the Spanish Data Protection Agency. By sending personal data, including an email, the user expressly accepts his or her inclusion in an automated file for which Mirlo is responsible. If such data were to be required in order to participate in any of our projects, it is possible that your data may be divulged in order to manage said participation. This cession shall at all times be necessary and shall be undertaken respecting at all times the requirements of data protection regulations. Mirlo does not handle or store the payment data of users who purchase any product or service or who make any contribution to Mirlo Positive Nature projects through mirlo.co, rather it is the company that manages the payment platform that is responsible for storing and handling such data. It is therefore recommended that you should be aware of that company’s confidentiality rules. Mirlo will only use your personal data to supply and manage requests for products or services made through the website and for invoicing purposes and, unless you were to state otherwise by marking the corresponding box, to forward information to you concerning Mirlo Positive Nature projects. Mirlo shall not cede users’ personal data to third parties without previously having requested their consent to do so, providing information as to the recipient of the data and the reason for this possible cession. In order to purchase any of the articles that are offered via the website it is necessary that the personal data supplied by the user should be at all times truthful and up to date given that, were that not to be the case, it will not be possible to deliver the purchased item. No operation shall be accepted for handling if all the data requested in the mirlo.co purchase form has not been provided or is incomplete. The user is responsible for the truthfulness of the data he or she provides to Mirlo, and usurping the personality or providing the personal data of a third party without their express consent is expressly prohibited. Should Mirlo become aware of any user having usurped the personality of another user, the former shall be deleted from the mirlo.co systems and Mirlo shall take the appropriate legal measures. The user should be aware that certain user information, such as for example the name of the user or comments he or she may make, may be seen by other users. The user may change or withdraw his or her information at any time. Whenever necessary due to the need to provide a correct service, Mirlo, as the company responsible for mirlo.co, will communicate with the user by emails sent to the email address that is included in the registration data. In order to guarantee the correct provision of the services that are requested, it is also possible that other means of communication may be used, were the email to fail. The services that Mirlo supplies through mirlo.co are aimed at users who are more than 14 years old. Under no circumstances are children under that age authorised to use our services. Due to the communication protocols that exist in Internet, when the user visits our website, Mirlo automatically receives the IP address (Internet Protocol) which has been assigned to his or her computer by the service provider. The registration of said IP address is purely for internal purposes such as web page access statistics. As a general rule, the IP address for one and the same user differs from one Internet connection to another, which makes it impossible to track the web navigation habits of any given user. The website may contain links to third-party websites. The user should be aware that Mirlo is not responsible for the confidentiality practices or the content of such other webs. We recommend that users be aware that when they use one of these links, they are abandoning our website and they should read the confidentiality rules of such other websites which may request personal data. These confidentiality rules only apply to personal data gathered via www.mirlo.co. Should you not have made manifest your desire to not receive commercial information, Mirlo may send you commercial communications concerning its products and services and the environmental projects in which it is involved. The user who wishes to modify his or her personal data or who wishes to stop receiving our services by cancelling his or her registration may easily correct, update or delete such personal data in the registration section. Should you wish to exercise your right to access, rectify, contest or cancel such data, please contact: Mirlo Positive Nature, S.L., Calle Seguidillas, 9, 2B, CP 38107, Santa Cruz de Tenerife (Spain) or send an email to this address: hola@mirlo.co. A cookie is a small data code file which is placed in the user’s computer when he or she accesses certain web pages. This type of file cannot harm your computer. Among other things, cookies allow a website to store and recover information relating to the use of the web, and this allows us to improve the quality of the web and to provide the user with a better experience. Cookies are an essential part of how the Internet works and offer countless advantages when providing interactive services. They make navigating and using our web much easier. Were you to disable our cookies, it is possible that you will not be able to enjoy all the services that mirlo.co offers; you may encounter problems when you use the web or when you open a new session. The information that follows will help you to understand the different types of cookies that Mirlo Positive Nature uses. Session cookies: these are temporary cookies which will be stored in the browser until you leave the website. This type of cookie is used to monitor the user’s movements in the web so that the system does not need to request information which has already been provided. Persistent cookies: these are stored in the hard disk and our web reads them whenever the user accesses our website. These cookies are stored in the user’s computer until their expiry date. All cookies have a specific expiry date on which they cease to be active. Technical cookies: which make it possible to navigate in the web and to use the different options or services we offer via the web such as for example, controlling traffic and the communication of data, identifying the session, requesting registration, using security elements while you navigate etc. These cookies are needed to ensure that the web page works properly. Third-party cookies: which are sent to the user’s computer from a computer or domain that is not managed by Mirlo Positive Nature but rather by a third party which will handle the data obtained via these cookies. Analysis cookies: which are either managed by us or by a third party and which make it possible to quantify the number of users who access the web thereby enabling us to gauge and to make a statistical analysis of the use of the web. Analysing the way in which a user navigates through our web page allows us to improve the products and services we offer. Personalised cookies: which allow the user to access the service with certain pre-defined characteristics of a general nature which are based on a series of criteria in the user’s computer such as the language, the type of browser and the computer’s regional configuration. Operational cookies: which allow a specific function of the mirlo.co website to run, such as, for example, sharing a specific content. 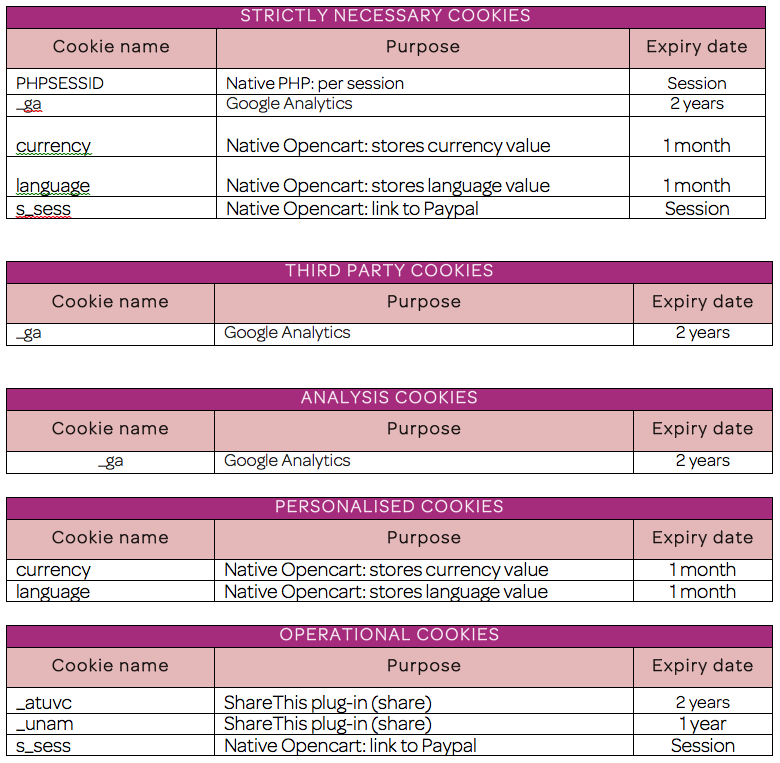 The following tables provide a schematic view of the cookies that have been described above and are used in the Mirlo Positive Nature web pages. For more information on Microsoft Internet Explorer, press here. For more information on Mozilla Firefox, press here. For more information on Google Chrome, press here. For more information on Safari, press here.